This article originally appeared in our Summer 2013 newsletter. Read other archived newsletters here. Although Huron Village is dominated by houses dating from after the Civil War to the first quarter of the twentieth century, it is actually well furnished with what are still called “modern houses.” We say “Modern,” although the four following examples were built nearly a half century to three quarters of a century ago. 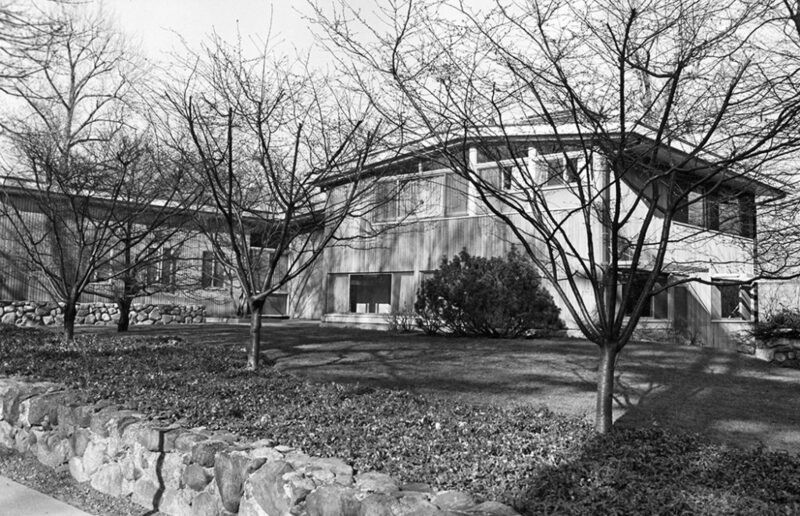 Three were built as the architect’s own house or for his parents, a time-tested method of introducing a difficult new style into a neighborhood. The oldest, 45 Fayerweather Street, (1940) was designed by Walter Bogner, a Harvard Design School faculty member. It was recently made a Cambridge Landmark. The clients were the Harvard mathematics professor Garrett Birkhoff and his wife Ruth, a talented gardener. 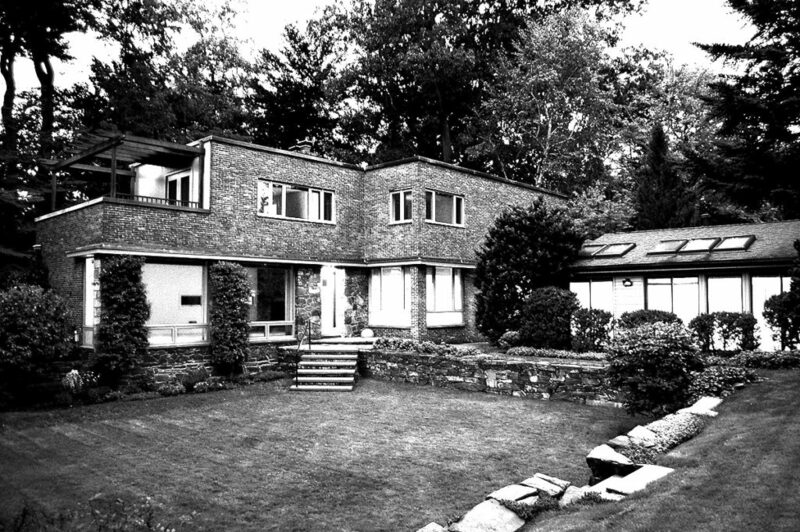 Designed in the then new International Style brought to Cambridge by Harvard School of Architecture professors Joseph Hudnut and Walter Gopius in the late 1930s, it was constructed in warm red bricks recycled from a demolished Beacon Hill residence. The house turns its back on the street to open with glass walls to the lot’s secluded and beautifully landscaped back yard. This private space used the stone foundations of the previous house on the site to define a generous sunken garden. 45 Fayerweather Street, 2012. Courtesy of Brattle Real Estate. 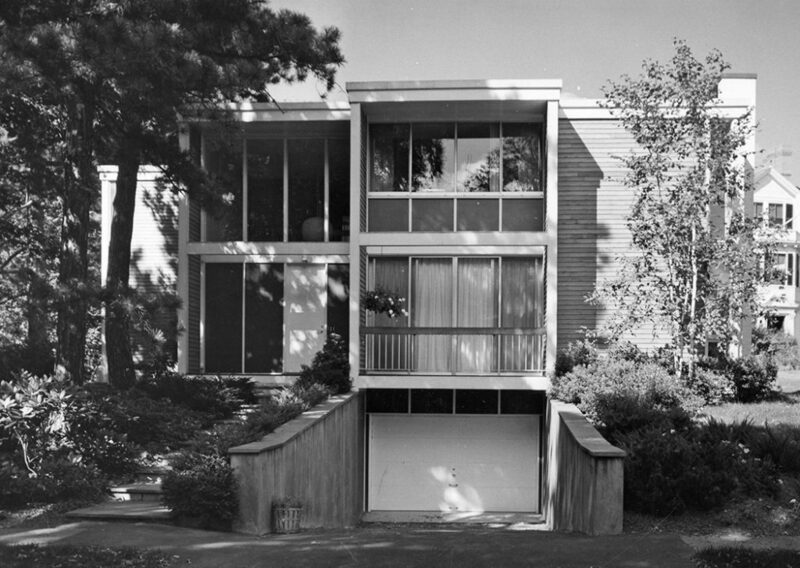 David Fixler, an authority on mid-century modernism, has called the house “simultaneously austere and sumptuous” and believes it “occupies a unique niche in the history of early modernism in New England.” In 2013, the Birkhff house was given Landmark status by the City Council – along with a very different neighbor, the 1882 Colonial Revival house at 28 Fayerweather St.
26 Reservoir Street (1955) was designed by Frederic Coolidge for his parents. Nestled into its corner lot and now screened by mature plantings, the informal look of the house is achieved by its matchboard vertical siding, a low-pitched gable roof and comfortable relation to its site. Like the others here, walls of glass unite the house with a private garden at the rear. 26 Reservoir Road, 1968. (R. B. Rettig) Courtesy of the Cambridge Historical Commission. Built one year later, James C. Hopkins, Jr. designed his own house at 5 Hemlock Road (1956) in much the same style, using the shallow gable roof and large-paned windows set flush with the siding, but this time employing deep, overhanging eaves. Now altered, it has lost some of the delicacy of the original design. 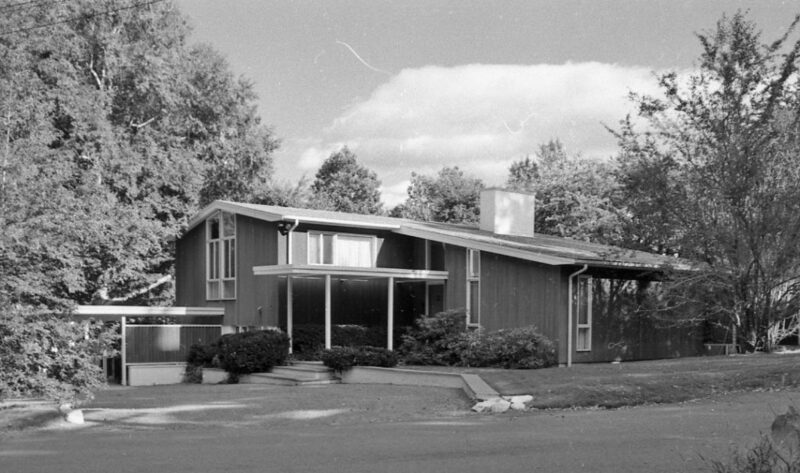 5 Hemlock Road, September 1968. Courtesy of the Cambridge Historical Commission. Last, architect Kenneth Redmond’s own house at 11 Reservoir Street (1965) uses varied massing but organizes it into a tightly controlled series of blocks and stacked cubes. The two-story building has a frank basement garage entered from the front, leaving the back garden open to a delightful swath of view. 11 Reservoir Road, 1968. (R. Cheek) Courtesy of the Cambridge Historical Commission. These represent but a sample of the International Style and mid-century modern houses in Cambridge. Other notable houses of the period in West Cambridge include the quite early (1937) 22 Follen St. by Carlton D. Richmond, Jr. and 4 Buckingham St. (1937) by Carl Kock and E. D. Stone, now altered with a mansarded third floor; the hidden 9 Ash St. (1941) by Philip Johnson; the seminal pre-fabricated Teckbuilt 23 Lexington Ave. (1954) by Carl Koch and Associates; a former garage altered as a house by Paul Rudolph at 144 Upland Rd. (1957); 64 Highland St. (1963) by F. F. Bruck; 4 Kennedy Rd. (1966) by Deck Associates; and 199 Brattle St. (1966) by Hugh Stubbins. Many of these replaced older houses on the site. For a fairly densely built city, Huron Village and West Cambridge can boast an impressive amount and variety of Modernist houses. And the impulse to build and live in a contemporary style has not disappeared, as new examples of non-historic architecture featuring simplicity, lots of glass, open planning and the use of contemporary technologies fuse to make intriguing new living spaces.